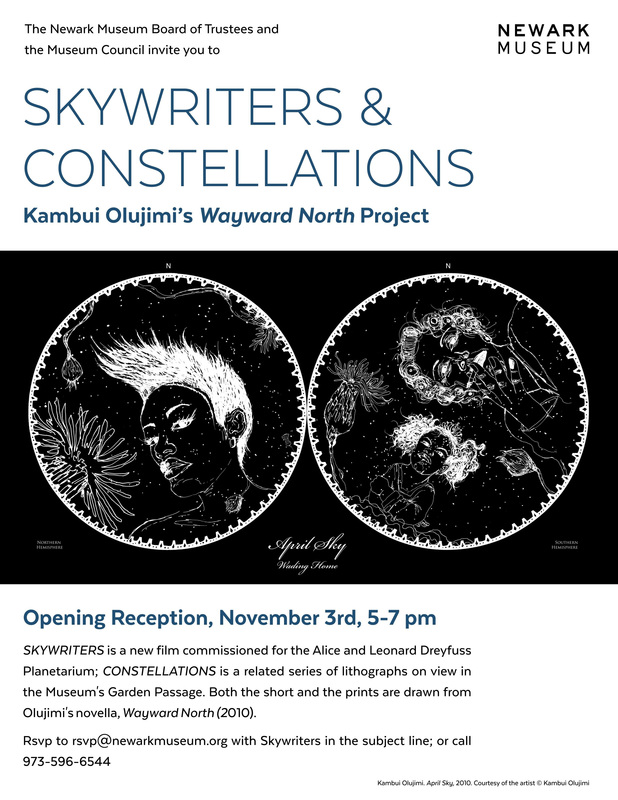 BFA Photography alumni Kambui Olujimi presents SKYWRITERS & CONSTELLATIONS, a solo exhibition at the Newark Museum. SKYWRITERS will premiere in the museum’s Dreyfuss Planetarium along with CONSTELLATIONS, a series of lithographs, debuting in the Garden Passage. Both works build on the narratives of Olujimi’s 2012 novella, Wayward North. Kambui Olujimi is a Brooklyn native whose multi-disciplinary practice calls attention to the assumptions that underlie our understanding of the world at large. The Opening Reception will be held on Saturday, November 3rd from 5pm – 7pm. RSVP ahead of time by emailing rsvp@newarkmuseum.org with the Subject “Skywriters”.